Pacific Princess is an award-winning Princess ship offering a cruise of discovery to a host of worldwide destinations. Pacific Princess offers passengers the opportunity to stargaze, attend talks by guest speakers and partake in highly recommended onshore excursions. There is also an onboard library with the latest books and itinerary-related literature, allowing guests to read up on the destinations ahead. Technology savvy passengers can stay updated 24 hours a day at the onboard 24-hour internet café. Sweet treats are not in short supply on board. Chocolate Journeys, in partnership with chocolatier Norman Love offers a menu filled with delectable chocolate desserts and creations. Afternoon Tea comprising of freshly baked treats and finger sandwiches is also served on board served in a formal setting providing the perfect opportunity to catch-up and enjoy some sweet treats. Another unmissable onboard event is Princess’ Festivals of the World event which takes place during select sailings and allows passengers to have a true taste of world tradition. During this event, passengers can enjoy the traditions, fun and music of some of the world’s most famed festivals. 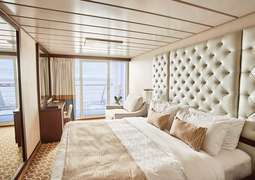 The Pacific Princess has recently undergone a total refurbishment and can now accommodate all 670 guests in fresh new cabins. All of the cabins are elegantly designed, spacious and very comfortable. 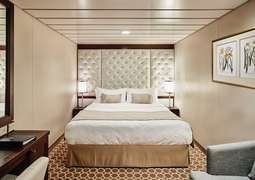 Be it an affordable Inside Cabins, an Outside or a Balcony Cabin offering fantastic ocean views or a luxurious Mini-Suite or Suite - you will feel right at home on board the Pacific Princess. The cabins are equipped with all the modern amenities you may need on your journey: a digital safe, a hair dryer, a fridge, a spacious closet and fine toiletries. The chefs on board the Pacific Princess are prepared to pamper you with traditional dishes and carefully selected specialties. This ship is home to numerous dining rooms, where your personal waiter will be happy to serve your favourite dishes at set dining hours. Snacks and smaller meals during the day can be found in one of the casual dining rooms and enjoyed either in the laid back atmosphere there or by the pool. A pizzeria, a Wine & Caviar Bar, and a small patisserie are also available for tasty morsels throughout the day. Dine on Italian specialties in “Sabatini's”, a cosy Italian trattoria. You are also welcome to visit the “Sterling Steakhouse”, where master chefs serve mouth-watering steaks with high-quality ingredients in an elegant atmosphere. Sail away from boredom with the Pacific Princess. The many different entertainment offerings on board will be sure to keep you on the go. Newly released films are regularly shown in the theatre. Visit the glamorous Vegas-style casino to test your luck or enjoy a cool drink at the bar. The nightclub and the pool bar are both known for their delicious cocktails and elegant atmosphere. Of course, there are also plenty of things to do during the day: beautiful art collections or enriching lectures by experts in various fields. You're welcome to retreat to the library with great books, or relax during a round of poker in the card room. Internet access is available around the clock. The Asian-themed Lotus Spa is there to help make your cruise as relaxing as possible. You are also welcome to visit the adjacent fitness centre to work out with modern exercise machines or run on the athletic track. Practice your swing in the golfing area or play a round of shuffle-board with friends and other passengers. The main pool on board is always worth a visit. Ride the waves, swim against the current, or just relax and cool off. Several heated whirlpools are also available for ultimate relaxation. Only on the Pacific Princess you can look forward to marvellous world cruising with a more familiar atmosphere and the greatest service you can expect on the seven seas. Launched in 1999, she has been in service with Coral Princess Cruises taking passengers all over the world with a cruising speed of 20 knots. With a mere passenger capacity of 680 people and a length of almost 180 metres she is by no means a small ship and therefore you will always get the incredible feeling of spaciousness and opulence. You have a choice between inside, outside and balcony cabins as well as suites. 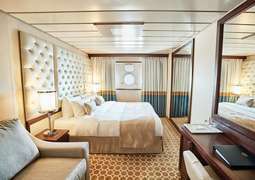 In each cabin you will find modern amenities to give you the most comfortable cruise yet including comfortable beds, storage space, telephone, air conditioning, hairdryer, television and refrigerator. Get ready for fantastic cruises all over the world to great destinations such as the Alaskan coast, the ancient city of Rome, the thriving Catalonian city of Barcelona, outstanding Casablanca, fantastic French Polynesia and various Mediterranean ports. On every cruise you can expect the best introduction to the coming ports and the chance to discover and explore these new lands. The Pacific Princess: Delicious and diverse cuisine! Dining on board the Pacific Princess consists of many different restaurants serving different kinds of fare. At the Club Restaurant you can look forward to comfortable dining in a truly opulent setting, delicious traditional food and impeccable service. Then there are more specialty restaurants such as Sabatini’s where you can get all your Italian favourites as well as many others you may not have tried before – every dish is cooked to perfection and follows the Italian tradition of using fine, fresh ingredients. The Sterling Steakhouse is a great place to get fantastic steak and seafood dishes served with hearty, wholesome sides to give you a satisfying meal every time. At the Panorama Buffet you can expect a great range of different dishes in a buffet setting so you can choose exactly what you want to eat, in the portion size you want and what you want to go with it – and as Coral Princess Cruises upholds the importance of choice, choosing this ship is a very important choice too! Get the most delicious fancy French cakes and pastries at the patisserie on board, fresh delicious pizza with various toppings at the Pizzeria and have freshly cooked barbeque dishes at the Deck Barbeque. Additionally there is room service available at all times. Pacific Princess: Chock full of fabulous fun activities! Entertainment on board the Pacific Princess consist of various activities such as watching a film at the theatre of which they are usually newly released titles available. Then there is also the opportunity to have a dance with Lady Luck at the casino in a truly rich atmosphere echoing that of the best places found in Vegas but if you would rather not take part in the gambling simply have a delicious drink. You can enjoy a fabulous night at the night club where many different drinks are available as well as popular music to get you up on your feet. 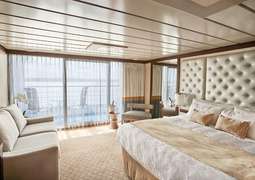 Look forward to a period of wellness on board the ship as you the pool where you can have a nice cool swim or a soak in one of the Jacuzzis. There are two spas where you can have different treatments to relax you to the full extent and feel rejuvenated while travelling to relaxing destinations. On the other hand you can also keep fit on board by going for a run, playing a game of tennis or using the exercise machines at the Lotus Spa. Stay connected to people beyond the ship by going online with the wireless Internet which is available 24 hours a day. Quieter activities include visiting the library where you have a choice of various volumes or having a game of cards in a small group of new friends or with your group. Take full advantage of the duty free shop before you leave and buy gifts for both yourself and friends. This amazing ship offers all the great options that Princess Cruises has to offer. Call now for the best deals and all the advice you need. Call now on 1300 887 590.